Heat oven to 200 degrees celsius. Clean and dry mushrooms and detach stems. Finely chop enough stems to equal 1 cup; set aside. Discard any remaining stems. Heat olive oil in a skillet over medium heat. Add shallots, Grape Nuts, mushroom stems, parsley and thyme to pan. Cook, stirring constantly, until shallot is softened and any liquid from mushrooms has evaporated. Stir in 1/4 cup of the white wine; taste for seasoning and mix well. Remove from heat. Spray the bottom of a 9-by-13-inch pan with cooking spray. Arrange caps in rows with cup side up. 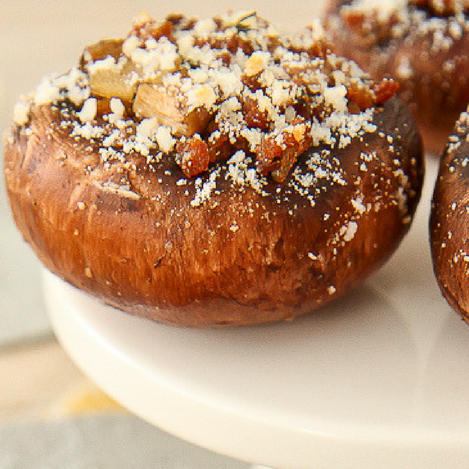 Fill each mushroom cap with some of the Grape Nut filling and sprinkle with Parmesan. Pour the remaining 1/4 cup of white wine into pan. Bake for 8-10 minutes or until mushrooms are just cooked and filling is hot. Remove each mushroom one at a time and place on serving platter. Serve hot.